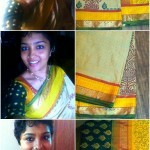 100sareepact | My moods painted in Kalamkari! My moods painted in Kalamkari! Sarees depict our moods n mysteries so well, don’t they! Here’s an example of one that embodies mine. I had put this pic up on Facebook a week ago to showcase my new designs. But there’s quite a dreamy inspiration to it. The saree is half blue and half brown. As a proud Gemini who enjoys the airy misty seas as much as the grounded n rooted earth; I wanted a saree with the combination of both. So I selected the light n breezy silk Kota & got my artist to paint busy and intricate flowers for the lower heavier earthy half & pure vivacious blue for the upper dreamy half! I’ve extended the half & half concept & designed the pallu to start earlier. This showcases the playfulness of the blue in the pleats below. 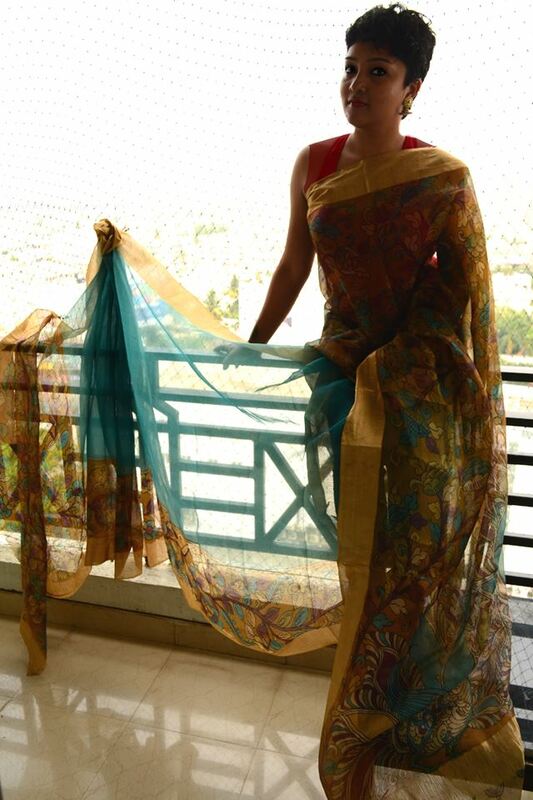 For me…every saree I design is a canvas…a place to shower my passion n love n moods! The intriguing backlight adds to the element of mystery too doesn’t it! Part of a Fashion Show!! !